Although an agreement was made by Misrata, Tawergha and the Libyan Government for the return, families from Tawergha are being barred and shot at by extremist militia members from the neighboring town Misrata. The UN, UK, US, Italy and HRW all released statements in condemnation and urged all parties to guarantee the Tawergha community's right to return to their homes under safe and humane conditions. We have started an email awareness campaign targetting all embasies world wide connected to Libya, all the Human Rights Groups, ICC and many more. We have enrolled and send the six, seventh & eighth batch of Windows 7 Enterprise laptops including a full office suite and basic applications for the Youth for Tawergha organization. The laptops are setup with an English and Arabic account including all updates and patches, Arabic language packs, virus scanner and some educational software like google earth etc. We have send them to our contacts in Tunesia who will ensure they are delivered to the boys and girls in the IDP camps. The laptops are being setup with an English and Arabic account including all updates and patches, Arabic language packs, virus scanner and some educational software like google earth etc. We will send them to our contacts in Tunesia who will ensure they are delivered to the boys and girls in the IDP camps. We recieved a request from the Tawergha Local Council to assist them with obtaining information necessary for the rebuilding of the HVA Dairy & Poultry Project in Tawergha which was completely destroyed during NATO bombardments in 2011 and looted by Feb17 rebels from Misrata. We contacted one of the main projectleaders who helped build the HVA project in the early eighties and he has forwarded the request to the HVA director. Due to the latest agreements between Misrata & Tawergha (assisted by the UN) we have high hopes for a solution. We have enrolled and send the ninth Windows 7 Enterprise laptop including a full office suite and basic applications for the Youth for Tawergha Organization Cyber Cube project and added a brand new beamer. The World Social Forum 2015 will be held at campus El Manar, Faculty of Science in Tunis. (24 to 28 March). Today we send nearly 200 personalized invitations to all the embassies in Tunisia and many important Human Rights groups or organizations to invite them to visit the Tawergha Mercy Association booth on the violations that are being committed in Libya against the people of Tawergha in support of their campaign for justice for the victims and to allow the displaced residents of the city of Tawergha to return to their homes safely. We hope many people will attend and pay the Mercy Association booth a visit and wishing them a successful couple of days. We have enrolled and send the fourth batch of Windows 7 Enterprise laptops including a full office suite and basic applications for the Youth for Tawergha Organization Cyber Cube project. We have enrolled and send the third batch of Windows 7 Enterprise laptops including a full office suite and basic applications for the Youth for Tawergha Organization Cyber Cube project. We have enrolled and send the second batch of Windows 7 Enterprise laptops including a full office suite and basic applications for the Youth for Tawergha org. Cyber Cube project. We have enrolled and send the first batch of Windows 7 Enterprise laptops including a full office suite and basic applications for the Youth for Tawergha org. Cyber Cube project. Due to the ongoing prosecution of families from Tawergha hunted by the Misrata militias, we are forced to hand over all donations directly to the IDP's instead of spending them on projects (like the Cyber Cube project) for the Youth for Tawergha. IDP's from Tawergha in Tripoli where evicted and those who stayed behind where shot or kidnapped. IDP camps in Tripoli and Benghazi where bombed and shot at and many personal belongings where destroyed by fire. Thousands of families from Tawergha are being hunted again by militias from Misrata (who took control of Tripoli last month) which forced the IDP's to flee to Tunesia. Last week we received a desperate request for help from the Youth for Tawergha Organization and the Mercy Foundation asking for financial support. Please read their letter and support them. To enable you to participate on twitter and facebook we created the Tawergha IDP picture gallery. Militias from Misrata attacked the camp of displaced people from Tawergha in Tripoli, Al-Falah area. The random shooting of people in the camp led to the injury of three Tawerghans. Five Tawerghans where kidnapped from the camp of which one was executed and four others where later released. We published a sitrep on the crimes against humanity. Please assist Amnesty International with this Tawergha Road Sign Action. Print the signs, create a picture holding them and send those pics to Amnesty. Amnesty will compile an album of all the pictures showing activists holding the new road signs to Tawargha and will deliver the album to the Misratah City Council accompanied by media coverage in Libya. The Tawergha Road Signs symbolise the way back home for the people of Tawargha. Amnesty International Arnhem group visited our HQ today and we discussed the Tawergha case and actions to assist them. Amnesty Arnhem will contact the Dutch Amnesty HQ for assistance and resources and will ask for the UK Amnesty group contact information who have taken the lead in the battle for freedom and justice in support of the families from Tawergha. After a vivid online discussion we registered www.misrata.org to host the Misrata Business Portal which will assist you in choosing the right company for your business or guide you in your purchases from Misrata, free of charge. The website will provide a list of all the companies and products from Misrata & will notify you which companies from Misrata do not support or endorse the crimes against humanity & will also provide information about the current status of the Misrata Tawergha reconciliation efforts and results. We met with Anita Witlox today who is the Dutch Amnesty International representative for Algeria, Morocco, Tunesia and Libya to discuss the current status, actions and affairs on the Tawergha case. Amnesty has written excellent reports on the forced displacement, ill treatment, torture and murder of the families from Tawergha and has two actions planned in the coming months. We have discussed options to cooperate and we are thankful for the tips and advice we recieved. The first future Cyber Cube arrived as a 20 FT shipping container at the premises of the PC en Werk Stichting in Nieuwleusen today (NL). The next couple of weeks will be spent on refurbishing the interior and transforming half of the container as a serverroom for the educational platform & the other half will be rebuild as a engineering area / office for maintenance and deployment tasks. The Cyber Cube will be filled with hundreds of thinclients, desktops & laptops to arrive at the Tripoli IDP camp within months. The Youth for Tawergha Organization webmaster has collected 80 Arabic movies on the Tawergha Youtube channel the last couple of years. Last week we have created dedicated media pages to display all those youtube movies on the www.tawergha.net website. The links to the 8 media pages are posted on the Tawergha twitter account which is followed by nearly a thousand Libyan tweeps so that's another major contribution to the ongoing awareness campaign. This week the Gesellschaft für bedrohte Völker Stiftung has released their latest report on Tawergha in support of their campaign to help the internally displaced persons in Libya. We were very happy to have been of assistance to the GFBV Stiftung to supply information and pictures for their report and we hope it contributes to more awareness and aid for now and paves the road to a solution in the long term. The Tawergha Foundation has provided the ICC with an extensive report based on dozens of official documents and information provided by the victims of ethniccleansing, torture and murder from Tawergha. The ICC has added the report to the file. For six hours every single minute a Dutch IT company or professional signed the petition form to stop the torture & end the ethnic cleansing of families from Tawergha. We have added the hundreds of signatures into one pdf file which we will send to the NTC, GNC and the Misrata Local Council members by e-mail and ask them to end the Human Rights Violations and Crimes against Humanity right away. It's been three years, enough is enough! The ICT Vakdag 2014 exhibition was a huge success and hundreds of Dutch IT specialists & companies signed the petition to stop the torture and end the ethnic cleansing of families from Tawergha today. They loved the #CyberCubes project for the educational platform 4 the Tawergha IDP camps and we received many invitations to pick up hardware. We will offer the signatures of support for the refugees in the Libyan IDP camps to the GNC, NTC & Misrata Local Council members this week. ICTWaarborg has reserved us a Lounge @ the Dutch ICTVakdag exhibition tomorrow (2014-05-12) in the JaarBeurs in Utrecht. Today we created the Dutch promo movie to show at the stand promoting the #CyberCubes Project 4 the educational program for the You(th) for Tawergha. It's probably not the greatest movie ever made and if you don't understand Dutch then there is no point watching it at all but we made the effort and hope that counts for receiving the support from the thousands of companies at the exhibition. The educational program for the youth for Tawergha organization was in need of a powerful, mobile, rubust & redundantly available server storage solution. We have set up a joined venture with the Dutch PC & Work Foundation to build the Cyber Cubes at their facility. The project resources and arrangements are well on the way & we expect to deliver the first Cyber Cube within a couple of months. Some of our Libyan followers on the Tawergha Foundation Twitter Page made us aware of the fact that we have a tendency to focus on the negative & horrible actions some of the Libyans have committed against the families from Tawergha. To compensate and rectify the view we might create depicting all Libyans as ethnic cleansers or torturers we have created the Libyan Heroes for Tawergha page as there are a lot of remarkable and kind hearted people from Libya out there. Please send your Libyan Heroes for Tawergha information to: heroes@tawergha.org so we can add them to the page. We know that most of them help from their heart and not for the attention but we think it is a nice thing to put some sunlight on them and it shows the world there are a lot of Libyans out there not agreeing with and supporting the villains & warcriminals. We met with the PC & Werk Stichting (Foundation) today and they will pick up the hardware we collected and enroll the use-able pc's with new operating systems and software. As they support the Dutch refugee Foundation they will also supply extra hardware we should need for the classrooms. We have been invited to the ICT Vakbeurs (by ICT Waarborg) on the 12th of May which is one of the biggest IT exhibitions in the Netherlands. We will promote the Tawergha Foundation educational platform for the youth for Tawergha organization and ask for donations and hardware. Today we designed and ordered the promotional products (T-shirts, flyers, posters and contact cards) for the exhibition. Last month we arranged the meeting for the RTL news crew in the Tawergha IDP camp in Tripoli. They were given a warm welcome and a guide through the camp multiple times. We are glad the Dutch News agencies have not forgotten about the 40.000 internally displaced persons from Tawergha and decided to show the Netherlands what the new regime in Libya is about. The last couple of months we had the pleasure to assist a very special lady in Libya who set up a educational campaign for the women in the Tawergha IDP camps in Benghazi. Amna Salak has written a report for her iRead project based on an extensive survey and she will present the results and her recommendations to the Libyan Government. We build this Actions & Results page today to track our actions and notify you of our results and we hope that you will take the opportunity to assist them or decide to support us in helping the families from Tawergha straight away. Today we had a meeting with the 1WE SNEW team to arrange the Cyber Cubes for the Tawergha IDP camps. We discussed the opertunity to convert shipping containers into mobile IT learning workshops & internet cafes. Today the Youth for Tawergha joined the New Libya Foundation workshop which brought together the Tripoli representatives of the Constitutional Assembly to share their vision of how the constitution making process can promote peace and stability in Libya. The program included an opportunity to dialogue with the Assembly members, followed by a reception where members from the civil society, business, international organization, government and diplomatic community could continue the dialogue on the most critical issues of the transition. The Networker is an event designed to advance the causes of Libyan civil society through cross-sector partnership on critical issues. We have send thousands of emails the last couple of months and one of the many people who responded to them was Sir Graham Watson from the European Parliament. He promised us he would certainly raise the Tawerghans’ situation with EU officials and soon after that Sir Graham Watson applied a question for a written answer to the EU Parliament. We are looking forward to the response and are hopeful this action will amount to a solution. Today the first Tawergha Foundation donations are spend on diapers in the IDP camps in Tripoli. Mr. Ali Noah & his colleague from the Merci Foundation arranged the logistics and the distribution in the camps and we are very thankful for their assistance. We send 600 emails to our Dutch IT linkedin contacts requesting for secondhand hardware for the cyber cubes project in the Tawergha IDP camps. Many Dutch IT companies & professionals responded and we have been driving through the Netherlands to pick up all the desktops, laptops, thinclients, monitors, servers, sans and other hardware. We are very thankful for all the help we received and the next couple of weeks will be used to clean an re-enroll all the pc's for the educational program. We have meetings with multiple partners to create the IT classrooms & internet cafe's and we will post updates within the next couple of days. Today the Canadian Ambassador Denis Thibault met with representatives of the Youth for Tawergha organization to discuss the situation of the Tawargha people and receive the Tawergha Foundation report. Mr. Thibault has assured us that the need to develop solutions for the Tawergha issue is stressed in every meeting with the Libyan government. He has provided the contact information for human rights organizations operating in Canada and the Canadian ambassy will reserve budget to support the Tawergha civil society organizations. The ethnic cleansing, ill treatment, torturing and murdering of Tawerghans has been unopposed and unchallenged by the Libyan Government, Justice department, army or international community. We are fed up with those fake #Feb17 revolutionaries taking part in the persecution of innocent families. are not only telling your mum but even your grandkids will be reminded what their DNA donor was all about. After another round of following up on our awareness email campaign, the Office of the Prosecutor of the International Criminal Court acknowledges receipt of our first official report on the Tawergha issue. 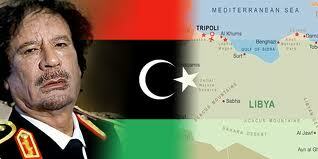 In her statement, Bensouda specifically mentioned Tawergha, a town outside of Misrata. A family from Tawergha seeking asylum contacted us this week asking for our assistance in obtaining enough information for their lawyer in support of the asylum request. We delivered all the required information to make sure their request would have to be honoured and we will do the same for anyone from Tawergha in the same situation so we recommend the ethnic cleansing is reversed as soon as possible or else all 40.000 refugees might come your way. The Dutch Tax Authorities awarded the Tawergha Foundation the ANBI status today. The Dutch Tax Administration can designate an institution to be an "Public Benefit Organisation"
At least 90% of the efforts of an ANBI has to be focused on the general good. And since 2012 the 'culturele ANBI' can profit (until at least 2018) from even more Dutch tax advantages. If in a calendar year the sum of someone's gifts to ANBIs exceeds 1% of the Dutch threshold income, the excess, with a maximum of 10% of that income, is deductible income. The last couple of weeks we have been working with the 'Gesellschaft fur bedrohte volker' organization and they have written their second report on the Tawergha issue. Within a couple of weeks they will follow up with their awareness campaign targeting important and influencial people in the German and Italian government for instance. We will keep you informed as soon as their awareness campaign is triggered. We finished the active support options page for Tawergha so if you are wondering how you can make a contribution and help them out, please check out this page as we have provided a couple of easy and quick means to accomplish your goal. We received our TechSoup registration today which enables us to provide the software for our educational goals for the youth for Tawergha. TechSoup was founded in 1987 on the belief that technology is a powerful enabler for social change. Since then, we’ve assembled a worldwide network of individuals and organizations that share this conviction. This network—one that you likely belong to—is working together to develop and share innovative solutions to our most urgent social challenges. On this special day for Libya we are proud to publish the first official Tawergha Foundation report on the status of the reconciliation process between Misrata and Tawergha. We have send the report to nearly one thousand organizations, foundations, embassies, political parties, governments and important people with the influence to make a difference for the people from Tawergha. We have also written a summary report for those of you who would like to read the quick facts and numbers. This week we send the first batch containing 2000 email messages written for Arabic businesses asking for their support and making them aware about the ethnic cleansing, ill treatment, torture and murdering of the families from Tawergha. We will send our message to 11.500 Arabic businesses in North Africa and the Middle East the next couple of weeks. Please spare us your small change so we can continue our projects in support of the youth for Tawergha. The founders pay for this foundation and website so 100% of your donations are used in active support of the families from Tawergha. Today we created the Tawergha Foundation Twitter account in support of the Awareness campaign. Please follow us to show your support and follow the latest news and campaign information to assist the youth for Tawergha with their goals. We've received many reactions on the awareness email campaign and one of those was Mr. Mohamed Benrasali who is one of the NTC members from Misrata and replied for a couple of people we wrote. "..some of those people are criminals (not all of them) and they refusing to hand them over.."
Mr. Benrasali couldn't appreciate the logic of our reply asking him how he would think about this kind of justice if it was his own family being locked up for crimes committed by someone from Misrata. By his crooked standards the whole of Libya could be locked up in IDP camps for not handing over certain criminal individuals to the ICC and by endorsing the ethnic cleansing on Tawergha there is a possibility that one day he and his fellow NTC, GNC and Local Council members will have to stand trial for their participation in the crimes against humanity. Today we build a website for the Youth for Tawergha organization to broaden their online presence and endorse the fabulous facebook page. Please check it out and hit the share and like button to show them your support and help them get their cry for help heard in the world. From today on the bank and Pay Pal account is ready to receive your donations for the people from Tawergha. We (the founding members of this Foundation) pay for all expenses for this Foundation and website so you can be sure 100% of all your donations go directly to the refugees and victims from Tawergha. The stop the ethnic cleansing and torture email campaign scripts and templates are written and active, ready for you to give us a hand. All you have to do is choose who you would like to send a pre-written letter (UN, Political Parties, Embassies, Misrata Local Council or Businesses, News Agencies, Libyan Government, etc. ), add your name and hit the send button to keep the pressure on those people with the power to make a change to stop the Ethnic Cleansing and Torture of families from Tawergha. Today we added the first entries to the Tawergha Destruction Database. A total of 1,690 damage sites were identified from satellite analysis between July 28, 2011 and August 18, 2012. Over 92% of all identified damages resulted from arson attacks, with the remainder of damages probably caused by controlled demolition with explosives, air strikes and the remainder by artillery fire. The notary office has officially registrated our organization as the Tawergha Foundation. Today we started to create the first entries in the Tawergha Torture Victims Database. Misrata imprisoned and tortured 1.300 men, many of whom were bruttaly slaughtered. The remaining prisoners who survived, fear servere torture or being killed on a daily basis. We cannot tolerate the awful deads of aggresion against Tawerghans as young as 15 years old. The hypocrisy of the perpetrators posing as #Feb17 freedom fighters is beyond our grasp. Today we created the Avaaz campaing for Tawergha Please support them with your vote to ask the United Nations and the Libyan Government to allow them to go home. Today we created the Special Thank You for helping Tawergha page as we are receiving more and more support and we think it's a nice gesture to thank those people. The page also serves as a reminder to the people from Tawergha that they are not forgotten or alone. The last couple of weeks we wrote emails to numerous organizations, foundations, embassies, political parties, governments and important people who could be of assistance to our cause or could provide us with information. We received a contactpoint for our training program from UNSMIL, discussed opportunities with the New Libya Foundation and received a lot of tips and advice. Our network with people from Tawergha living in the IDP camps and abroad has grown and we now have a solid base to build our organization from. So what can we do to help and where should we start? We found the Youth for Tawergha organization online at www.tawergha.com and with the google chrome translation function we read up on their goals to assist the youth from Tawergha. Today we created the Tawergha Foundation on facebook page in support of the Awareness campaign. We will post news items, reports and our succes (or failure) posts on a regular basis so please Add us to show your support and follow up on the progress. During our quest for information we where amazed how many organization & country reports on the Tawergha issue existed. Amnesty International, Human Rights Watch, UNSMIL, the ICC, IRIN, CFC, ILAC, RefWorld and many more have been writing extensive official reports for years. We have collected and stored all the official reports in chronological order. In 2011 revolutionairy rebels rose up against Gaddafi and his troops and soon many parts of Libya took part in the uprising. The UN had to step in to assist the freedom fighters as they where heavily outgunned. Even with NATO's support the fighting went on & on. months to put our minds to anything else. As a result we missed the ethnic cleansing & genocide on the families of Tawergha in the news. We started with building a chronological news items database on the events which ended in the ethnic cleansing, genocide, torture and other inhuman treatment of the families from Tawergha. After being send a facebook message pointing out the satellite images on google earth depicting our formal homes in Tawergha having been destroyed we found the first reports about the ethnic cleansing of the families from Tawergha. As soon as the horror and disbelieve somewhat settled down we decided it was time we build this website in assistance of the surviving refugees. We hope our effort will contribute to their return and well being. Should you have some time or small change to spare, please give us a hand.